INITIATIVES - The Lethbridge Public Library Bookmobile program has been in operation for over 3 decades. This "mobile branch on wheels" serves areas of Lethbridge, Alberta that are new or are without a local library, often making stops at schools and malls to better connect with those communities. After 30 years on the road, it was decided that the original vehicle needed to be replaced. The new mobile unit is roomier and better equipped for the digital age. The following series of videos was filmed during the 2015 launch of the library's new bookmobile, custom built by local manufacturer, Intercontinental Truck Body. FILM - Canadian Pacific is a 1949 big-budget historical drama starring Randolph Scott (1898-1987), Jane Wyatt (1910-2006), and introducing Nancy Olson (b. 1928). Apart from the fact that Canada built a Trans-Continental Railway during this time period that followed the same route through the Rocky Mountains, the story is largely fictional and historically inaccurate. The plot centres around the conflict between a CPR surveyor (played by Scott) and a group of fur traders ("west of Calgary") who want to put a stop to the railway's construction. Despite the seemingly insurmountable obstacles (geographic, political, and financial) which the project faced, an armed insurrection was not one of them. Western settlers welcomed the railroad, treaties had been already forged with First Nations, and prime fur trade country (rivers, lakes, and forests) lay well to the north of the steel. None-the-less, Scott's character is likely based (however loosely) on the real life explorer and surveyor, Albert Bowman Rogers (1829-1889) who was indeed American (like Scott's character) and did discover the all important Rogers Pass, which proved pivotal to the route to the Pacific the CPR would ultimately take. 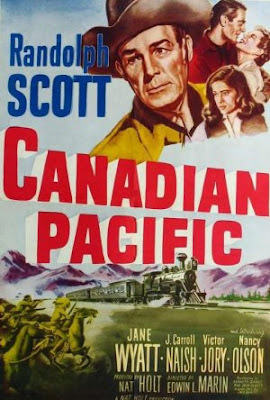 Canadian Pacific was filmed in Banff and Yoho National Parks, and on the Stoney Nakoda First Nation. Known then as the Stoney Indian Reserve, other Hollywood movies shot on location there include: Buffalo Bill and the Indians, or Sitting Bull's History Lesson and Open Range.